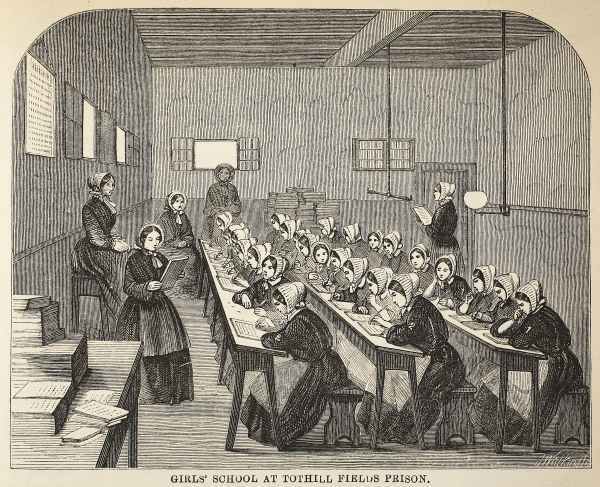 ‘Girls’ school at Tothill Fields Prison’, in Henry Mayhew and John Binny, The Criminal Prisons of London and Scenes of Prison Life (London, 1862), facing p. 356. 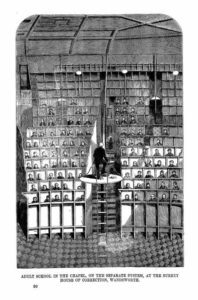 Historians have long been aware of the existence of 19th -century data on prisoner literacy, even if they have been shy about making use of it. 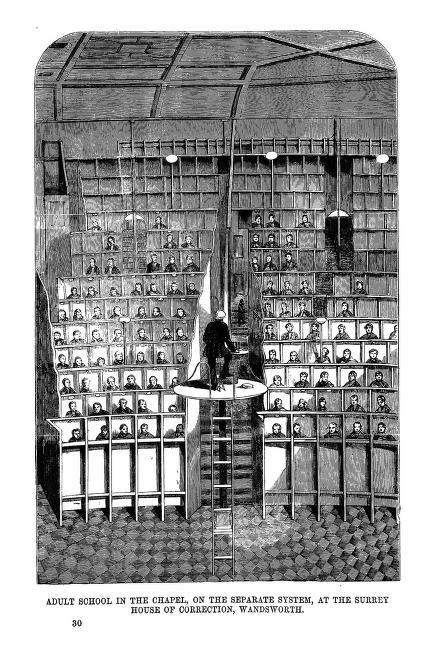 The expansion of prison education in the early 19th century meant that the practice of assessing prisoners’ literacy skills became widespread, and from 1835 keepers of prisons were asked to return numbers of prisoners who could read, read and write, and do neither to the Home Office for inclusion in national criminal and penal statistics. However, much less is known about a related activity, the collection of evidence on prisoners’ schooling at a number of penal institutions across England. The earliest example I can find of this practice dates from 1827. In February of that year, officials at Wilton Gaol in Somerset began to write the names of schools attended by prisoners next to descriptions of their literacy skills in the Summary Registers. On some pages, they ruled in an additional column, labelled ‘school’, to better organise their information. By the end of 1828 an official column had been added to the Register with the heading ‘If he or she has been to a charity school’, together with another, entitled ‘[number] of years left school’. New Registers were designed in 1831 with printed, as opposed to ruled and handwritten, columns and headings. The interest in prisoners’ schooling was further formalised with the inclusion of a column headed ‘If taught at Sunday or Charity School’ which was further subdivided into ‘Name of School’ and ‘Years Left’. In the absence of any additional evidence, we can only hypothesise as to why officials decided to collect this information from prisoners. The most likely explanation is that schooling data was used to aid the interpretation of literacy data. In the 1820s, as chaplains transformed assessments of prisoner literacy into numerical statements of the proportions able to read, read and write, and do neither, many found that the spread of skills among prisoners was more widespread than expected. They became interested in where these prisoners had acquired their skills and conducted investigations. Several noted in their annual reports that many juvenile prisoners in particular had been schooled in the various parochial and national schools. But they also noticed another problem. Despite having been to school, large numbers of prisoners forgot the skills they had learned. And, even more troubling, many demonstrated a substantial degree of ignorance, especially of their moral or religious duties. This explains the interest of officials at Wilton in recording the number of years that had passed between a prisoner’s time at school and their committal to prison. By the 1830s, comments on prisoners’ schooling had been transformed into tables of data in the annual reports of the prison chaplains. The most prominent example of this practice was the reports of the Rev Thomas England, who had been appointed chaplain to the new juvenile convict prison, Parkhurst, in 1838. In his first report dated 6 June 1839, England drew attention to the exceptionally large proportion of juveniles under his care who had attended school (94 of 102), more than half of whom had been day scholars at National or Lancastrian schools, and 69 of whom had been at school for periods exceeding 12 months. Their schooling had meant that they had acquired some proficiency in the elementary skills, especially reading. But when he tested their knowledge of the Church Catechism and the Scriptures, England found that the prisoners could give little account of the meaning of the words they read. This was the result, he argued, of a damaging reliance on rote learning at both day and Sunday schools. England’s report landed on the desk of the Home Secretary, Lord John Russell, right in the midst of an important parliamentary debate on the education of the masses. The schooling statistics derived from prison registers provided the evidence which Russell needed to argue the case for the establishment of a schools inspectorate to ensure that the government was receiving value for money from the Treasury Grant set up to aid the efforts of the two schooling societies, the National Schools Society and the British and Foreign Schools Society. On 20 June 1839, Russell quoted at length from England’s report to demonstrate the need to drive up the quality of teaching at state-aided schools. This publicity further encouraged the collection of information on prisoners’ schooling. The Rev Burnett at Lewes House of Correction and the Rev John Field at Reading County Gaol both began to include tables showing where prisoners had attended school in their annual reports. Surgeon Superintendents on convict ships also began to make notes on prisoners’ schooling in their log books. And three prisons, Knutsford House of Correction, Bury St Edmunds County Gaol, and Ipswich County Gaol, ordered new registers from Hudson & Kearns printers in London which included the question, ‘Where did prisoner go to school, and how long?’. Lord John Russell’s belief in the utility of data on prisoners’ schooling continued. In 1853, as part of his attempt to bring forward a measure on mass elementary education – namely, legislation to secure rate aid for urban schools – a request was made by Parliament to the governors of all prisons in England, convict and local, to return the number of persons who had received their education at prison schools, workhouse schools, Sunday schools, mill or factory schools and common public or private day schools. The data returned was enlightening. 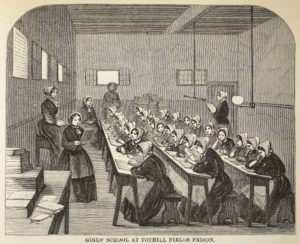 Over two-thirds of those in custody on 18 April 1853 had attended common public or private day schools, and only 10% had never received an education, either inside or outside the prison. In fact, the figures for day school attendance broadly matched those that would be released as part of the Education Census the following year which estimated that about one third of children who ought to be in school were not. In other words, prisoners were by no means exclusively drawn from those who did not attend school. Unlike the Rev England’s data in 1839, the impact of this return was negligible. It was presented to Parliament in August 1853, by which time Russell’s Education Bill had been dropped, and the attention of Parliament was consumed by Charles Adderley’s Bill for the establishment of reformatory schools. The latter was part of a broader initiative to address the specific educational needs of criminal and potentially criminal children. As politicians, policymakers and social commentators argued more strongly than ever before that there existed a distinctive criminal class in need of particular treatment, including a particular type of education, there was a rapidly diminishing appetite for data which suggested prisoners’ educational experiences might be used to help form policy for the education of the working class as a whole. It is this idea that the criminal class must have been more ignorant and less literate than the general population, or even the working classes, that has led historians to be dismissive of the evidence of prisoners’ education that exists in penal records. My article in Social History suggests that this assumption is largely unfounded, and that there is much to learn about the educational experiences of the labouring poor from the data contained in prison records. Its focus is the schooling records found in the registers of the two county gaols in Suffolk, at Bury St Edmunds and Ipswich. Between 1840 and 1877, over 16,000 men and women confined in these two prisons gave information about their literacy and schooling. Combined with other information such as age, birthplace and residence, occupation, and previous imprisonments, and placed within the context of the schooling landscape of Suffolk, the data reveals some truly extraordinary patterns in the acquisition of the literacy skills in 19th-century England. Rosalind Crone is Senior Lecturer in History at The Open University. Currently she is leading an AHRC-funded project on ‘Educating Criminals’ which examines the role of prison education in the evolution of the modern British penal regime. Her article, ‘Educating the labouring poor in nineteenth-century Suffolk’ appears in Social History, 43:2. Somerset Archives and Local Studies, Wilton Gaol, Prison Registers, 1810-47, Q/AGW/14/1-3, and Summary Registers, 1826-31, Q/AGW/14/4. Reports relating to Parkhurst Prison, 1839 (Parl. Papers, 1839, XXII.645), pp. 17-18. Hansard, House of Commons Debate, 20 June 1839, cc578-689. specifying the number who have, and who have not, received an education (Parl. Papers, 1852-53, LXXXI.311). This entry was posted in Uncategorised on 11th April 2018 by Grainne Goodwin.